Astronomers have discovered 12 new moons orbiting Saturn, bringing its number of natural satellites to 46. The moons are small, irregular bodies - probably only about 3-7km in size - that are far from Saturn and take about two years to complete one orbit. All but one circles Saturn in the opposite direction to its larger moons - a characteristic of captured bodies. Jupiter is the planet with the most moons, 63 at the last count. Saturn now has 46. Uranus has 27 and Neptune 13. 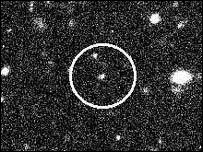 The latest ones were found last year using the Subaru telescope in Hawaii. Confirmation observations were made last month using the Gemini North telescope also situated in Hawaii. Dave Jewitt of the University of Hawaii, co-discoverer of the objects, told the BBC News website that they were found as part of a detailed survey of the outer planets in order to better understand their origin. The newly-found satellites were probably formed in the main asteroid belt between Mars and Jupiter, and scattered out of it by the tug of Jupiter's gravity. "The key question is how they became captured by Saturn. The current models devised to explain how such bodies are captured are unable to explain why they reach the orbits they do," said Dr Jewitt. "The new discoveries should improve our knowledge of satellite systems in general and should, eventually, lead to an understanding of how such small, irregular bodies are captured by the gravity of giant planets. "Having more satellites to study will give us more data to plug into our computer simulations that may tell us what happened," he added. Astronomers have found that all four giant planets - Jupiter, Saturn, Uranus and Neptune - possess about the same number of small irregular satellites irrespective of the mass of the planet, the orbit of the satellites, or if they were captured or formed in orbit. This observation remains unexplained.